Feta Stuffed Red Bell Peppers make one of the best vegetarian side dishes or snacks. These are so good that you won’t want to start the main dish on your table. The best thing about these feta stuffed red bell peppers is that they are ready in under 10 minutes. Easy, fast, tasty with a nice look. Are you in? These are one of our staples at our home parties and our guests are always happy when they see these on the table. To be faster for this recipe, I didn’t roast the red bell peppers myself, I bought it from the market. It’s not something I always do, but I’m not completely against it either. When you don’t have enough time, you can use the shortcuts, right? Ok I must admit that I sometimes love shortcuts. Not every time though. You can definitely roast them yourself either in oven or on the stove if you have time. It’s not something hard, just needs time. These feta stuffed red bell peppers are definitely life saver when you have unexpected guests for dinner, so it is a good idea to have roasted peppers in the fridge for such times. You can even make these when your guests are sitting in the living room. You may want to try our cheese stuffed green peppers that are fried if you want to see another option. You will need some more time for it though. The filling is so good that I can even eat it as it is. Love to spread a little on a slice of bread when preparing these peppers. The tartness and creaminess of Greek yogurt is very well paired with feta. And garlic is definitely a must in this combo. What you need to do for the filling is simple. Mix feta and Greek yogurt. Add in chopped parsley or fresh dill, mashed garlic and salt. Then stuff the roasted red bell peppers with this filling. Finally and optionally, whisk olive oil and lemon juice together and drizzle over the stuffed peppers. 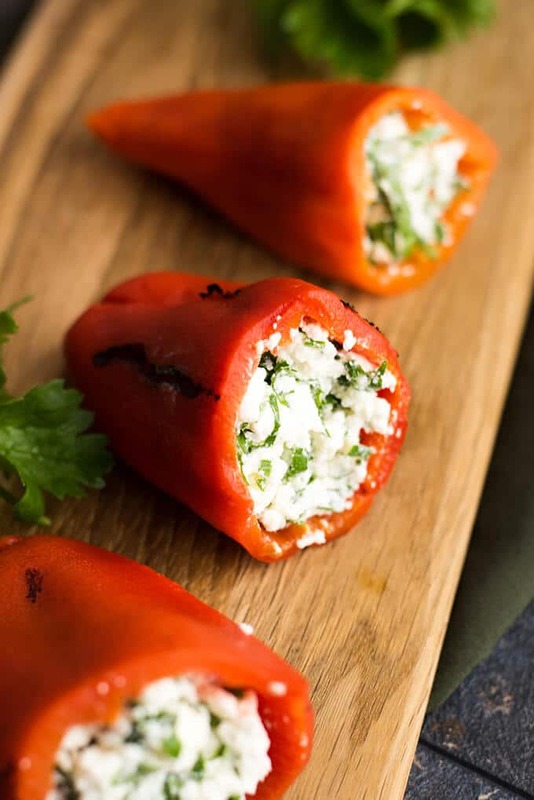 Don’t you think these feta stuffed red bell peppers make wonderful appetizers for game nights too? I know we aren’t even close but you should keep this recipe for your next Super Bowl party. 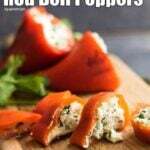 A wonderful appetizer with roasted red bell peppers. Stuff them with a mixture of Greek yogurt and feta. In a separate bowl, whisk lemon juice and olive oil. Drizzle it over stuffed peppers right before serving. Hi Christina! 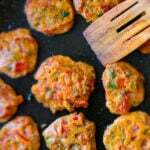 You can make these ahead of time and keep in the refrigerator for a day or two. I’ve never tried freezing them, but I guess they would freeze well. Made the filling and will stuff some peppers later. But noticed the carbohydrates are high! Why? from the peppers? Just curious to what is causing it to be so high in sugar. You’re right Vjera! I just love the color of red bell peppers more! In the picture, it looks like the peppers have been roasted, but still have their skin on… Can you clarify? Thanks! I peeled their skin indeed. There might be tiny pieces left though. I’m not sure I’d feel full just with these Kim. Lol! This sounds fantastic; I am 100% in for this. We have a lot in common for sure as we have a common history just like with Armenian, Greek, Albanian cuisines.